Caring for clear braces is just as important as caring for traditional metal braces. Although there is much less of a daily requirement for cleaning and ensuring pieces of food or particles are dislodged from metal braces, ignoring the maintenance routine for clear braces can be detrimental. Keeping the right care routine in place throughout the timeframe a person has clear braces is important not only for the results of straighter teeth but that none of the inserts and retainers are lost or damaged during the procedure. How do I care for clear braces? Caring for clear braces could seem extremely easy, and it is. However, because of the ease, it can cause people to become lax and not take proper care of the device and wearing routine that they need in order to get the best results. 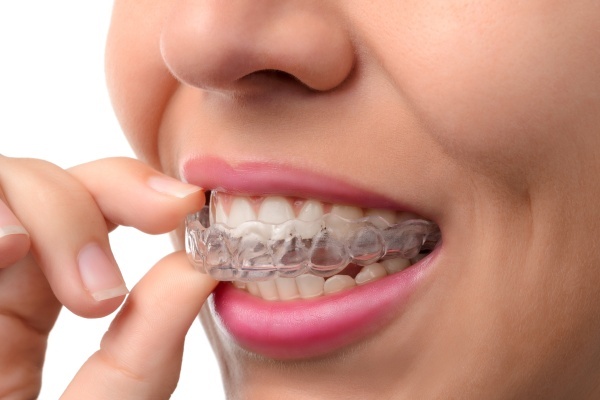 Clear braces are known for their amazing abilities to straighten teeth, however, it is just as important to follow the instructions and guidelines during the treatment using the braces. When using clear braces it is important to always remove them during meals. Although it is okay to drink when wearing them, ensure that it is not a liquid that could stain the clear aligners such as coffee. If a person decides to drink a beverage like that, it may be best to remove the braces while drinking. However, whenever it is time to eat, the clear braces need to be removed. This will ensure that no food or particles get stuck underneath the braces. It will also ensure that the clear braces do not become broken or cracked from the chewing. Although they are tough, the toughness needed for chewing food is not what they are made for and could be detrimental to them. By simply removing the braces before a meal, rinsing out the mouth after and putting the clear braces back into place, the wearer of these will be in the clear and following the guidelines to continue getting straighter teeth. To help and avoid any bacteria or tiny particles from getting on and inside the braces without being dislodged it is important to remove them a few times throughout the day to rinse off. After rinsing them under running water for 20-30 seconds, simply put them back on your teeth and you will be good to go! Because it is important that the braces are in proper order with no cracks or breaks, if something seems not right or broken, call and speak to your dentist. They can help resolve any issue and guide you in making the best decision. Since clear braces rely not on the constant pressure on the teeth and area around them, having a part broken that could cause the pressure to be uneven could lead to more trouble. It is never a bad idea to let your dentist or orthodontist know if something seems amiss. Do you have any other questions about how to care and keep your clear braces in the best condition? Feel free to call our office any time and we can answer any additional questions you may have and help you make the best choices for your oral health and dental routines. Contact us today!